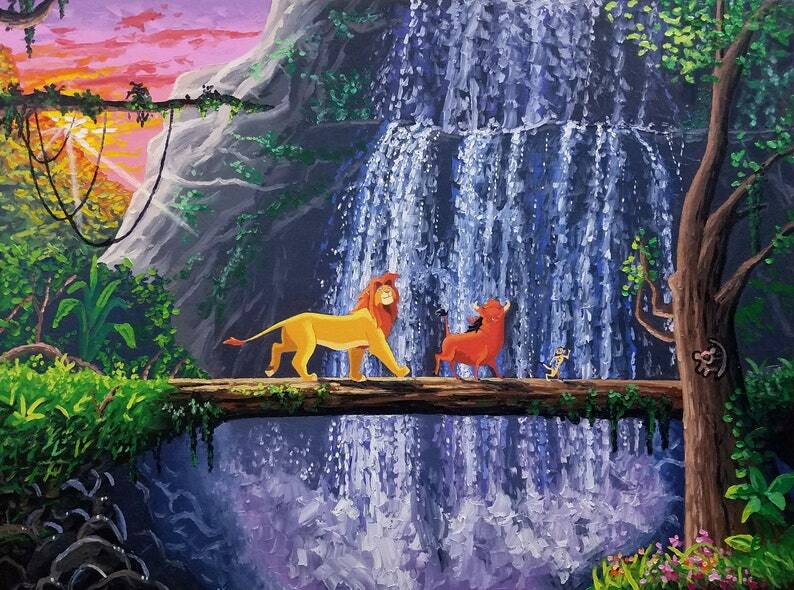 It was a true joy and pleasure to paint a scene from my favorite movie since I was a boy. There are simply no words to describe the experience! :) I put everything that I love about The Lion King into this large textured palette knife painting. This is also the first landscape I've created for my shop, as I am a seascape painter. --This is an *ORIGINAL* oil painting on stretched cotton canvas. It was done with palette knives. --Sides of canvas are painted black for a professional display. No need to frame! --Comes with a certificate of authenticity. I DO NOT own the rights, they belong solely to Disney. This is an original derivative work based from the characters in the film. my second painting from ryan, and equally as stunning as the first. incredible art! keep up the great work! colorful and vibrant painting, very awesome to see it made on Youtube!! Makes the purchase special. I accept most forms of payment, including Etsy gift cards. Taxes are included in the sales price. I am happy to offer a *FULL REFUND* for any reason if you are unhappy with your purchase. I enjoy my work and am confident that you will too! Buyer will need to ship painting back to me BEFORE refund can be given. Please keep in mind that the colors in the photos are as close to what you will see as possible. There will always be variations because of different computer settings and lighting. I shoot my paintings in my studio under a bright daylight bulb that renders colors accurately. FREE Shipping for domestic and international orders via Fed-ExGround. Customer will need to pay for upgrade. Standard processing will be 1-3 days to be ready to ship out, but could be longer if the artwork is still wet and needs time to dry. ***My prices are ALL uniform by size. All 16x20's take me about the same amount of time to complete, and 11x14's, etc, etc...My original palette knife beach paintings are high-quality and unique and that is reflected in my pricing. ***Overall price is determined by size, detail, experience, technical skill, and cost of materials. I use more paint in my work since I paint in thick textures with a knife, so that is a large determinate in how I price my beach paintings. Like a specific painting but need it in a larger size? I can certainly do that for you! ***Keep in mind that the larger painting will NOT look identical to the smaller one that you like, for palette knife strokes are impossible to replicate exactly. No two strokes are the same. But the colors and subject will be the same, so the painting will look very similar. This is an important disclaimer. I pride myself on offering only 100% original artwork at this time in my shop. So when you buy a Ryan Kimba beach painting you will have the satisfaction of knowing that you have the only one like it. *I can also paint a special commission for you of your favorite beach or vacation spot. Message me or send me an e-mail to get the process started and to obtain more information. I require 50% down when working on a commission and will send you an invoice through PayPal to get the process rolling. I look forward to working with you! How long have you been an artist? Most of my life, actually. I find that is common for a lot of creatives. It is something you pursue from an early age. But professionally speaking, I have been selling my work since 2011. How large are your pieces? The size of my paintings varies from 9x12 inches up to 36x48 inches. If you would like a larger painting, just send me a message or email so that I can work with you on a special commission. Do you use reference photos before you start? Yes, I like to use reference photos. But I always have a vision in my head that is usually totally different from what I am looking at. The reference material acts like a bridge to help me arrive at the scene I see in my mind. They are so much more freeing than using brushes, in my opinion. Knives allow you to paint more loose, and in the process, make your art more expressive and impressionistic. I don't like being too tight unless I am working on a very large canvas that warrants the extra detail. Do your pieces need to be framed after being purchased? No they do not. Since I paint the sides of each canvas, they can be hung right out of the box. Painting the sides different colors helps make the art "pop" and also gives the piece a professional presentation. I paint the edges light blue, dark blue, black, and tan. Which art school did you graduate from? I didn't go to art school. I am mostly self-taught. I use the word "mostly" because I have learned a lot from other artists. I have always believed that the world is your art school. An art institution is no match for life experience. Are your paintings inspired by particular places? Most of my beach paintings are not real places. They are made up in my head. They are places I'd like to be or I think my audience would like to be. But a lot of them are inspired by some of my favorite places, like Florida, Hawaii, South Carolina, and the Great Lakes. I live in lower Michigan and love painting Lake Michigan and Lake Superior. How do you create the thick textures in your work? I spread the paint on the canvas, much like covering a cake with frosting. I continue applying these mounds of various colors until I am happy with the result. A few of my works have MANY layers in them. The cool thing about my painting style is how the layers of paint sparkle under the light. How do I properly take care of my new oil painting? Do not hang your painting in direct light in your home, as any painting will dim or yellow over time when hung in that environment. It is also not a good idea to hang it near your shower in your bathroom. If you have a larger bathroom and hang it away from high-moisture areas it will be okay. Why did you choose a starfish for your artist logo? The starfish is kind of like the ambassador for the beach! Also, starfish are beautiful animals and I felt that it fit perfectly with my image. My logo is a big part of my branding and I want it to be one of the first things people see. It makes them think about me :) I paint a little starfish in the bottom left or right-hand corner of every painting, with an "RK" inside of it. This serves as my exclusive artist signature.